Usually on this blog, caterpillars are featured as reluctant hosts for a variety of different parasites, ranging from parasitoid wasps to insect-killing nematodes. But in today's post, it is a caterpillar that gets to star as the parasite. Meet Epipomponia nawai, a caterpillar that is found across parts of eastern Asia from China, to Korea, and Japan. Unlike most other caterpillars that munch on leaves, the caterpillars of E. nawai cling to and gnaw on the flanks of cicadas with their sharp, slender mouthparts. Epipomponia nawai belongs to a very unusual family of moths called Epipyropidae - they are also known as planthopper parasite moths because they have caterpillars that live as ectoparasites of planthoppers. Epipomponia nawai is even more exceptional in that instead of parasitising little planthoppers, its caterpillars take on big chunky cicadas as hosts. In a recent study, a group Chinese scientists conducted a field survey looking for E. nawai at Tangyu Valley, in the Shaanxi Province during the summer months of 2013 to 2016. They recorded any E. nawai that they came across, and brought some those parasitic caterpillars (along with their cicada hosts) back to their laboratory to record their development and behaviour. The caterpillar of E. nawai looks like a fairly-ordinary reddish orange grub, but when it reaches its final instar (the stage just before turning into a pupa) it becomes covered in a fluffy white coat of wax, giving it an appearance not unlike the woolly bug from The Ancient Magus' Bride. The thoracic legs of E. nawai are fairly short and stumpy, but each ends in a sharp curved hook, and the fleshy, sucker-like prolegs on its abdomen are also lined with a series of microscopic, velcro-like hooks. This allows E. nawai to not only cling firmly to its host, but also to scurry across the cicada's body if the need arises. Once it is ready to pupate, the caterpillar safely detach from their host by abseiling down on a strand of silk, extruded from the spinneret beneath its mouth. It then climb to the nearest tree branch to make a fluffy cocoon. The adult moths emerge in early August over the course of about two weeks. In contrast to the distinctive-looking caterpillar, adult E. nawai is a fairly ordinary-looking moth. The adult only lives for a few days and do not have a functional mouthpart; its sole raison d'être is reproduction. So in another words - it has no mouth and it must mate. After mating, a female E. nawai can lay up to 200 eggs over her short life, but some female moths forgo mating altogether and are capable of produce viable eggs asexually - which is very unusual among moths and butterflies. Unlike parasitoid wasps and flies that lay their eggs directly onto or into their hosts, E. nawai moths deposit their eggs on tree bark. So the newly hatched caterpillars have to somehow find their own way onto a suitable cicada and it is not currently clear how they manage to do so. While it seems the raucous call of male cicadas would be the most obvious signal for E. nawai caterpillars to home in on (this is how a species of parasitoid fly track down its cicada prey), only male cicadas call, but E.nawai infects both male and female cicadas equally, so they must be tracking down their hosts through some other means. While there are some other lepidopterans such as the blue butterfly and the cuckoo moth which have caterpillars that live in ant nests as "brood parasites", the kind of ectoparasitic life style led by E. nawai and other epipyropid moths is unique among lepidopterans. Although it is the odd one out among moths and butterflies, E. nawai and its fellow epipyropids join the ranks of an estimated 223 animal lineages that have independently evolved along the path of parasitism - and have never looked back. Liu, Y., Yang, Z., Zhang, G., Yu, Q., & Wei, C. (2018). 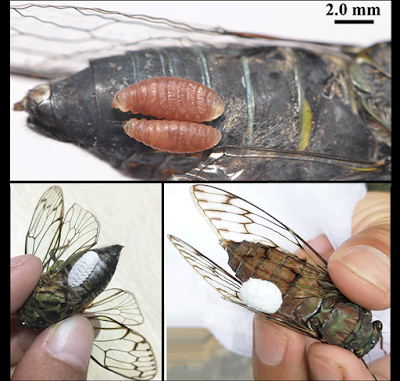 Cicada parasitic moths from China (Lepidoptera: Epipyropidae): morphology, identity, biology, and biogeography. Systematics and Biodiversity 16: 417-427.